This is the same editor of Agony of Deceit. In many areas the book is powerful. Part 2 is a series of three articles (by J.H. Armstrong, D.A. Carson and J.M. Boice) on the Vineyard movement which is one of the most telling reports to come out. Part 4 contains three articles on the modern Christian emphasis on counseling and psychology. It may pull the pendulum back past center for a moment but it needs to be pulled a little. Part 5 is an Evangelical (and I think somewhat biased) view of Fundamentalists and their conservative approach to the world’s problems. I profited greatly from the book. If I have a concern it is that Horton seems to surround himself with very Reformed, Calvinistic thinkers. In his own books (I reviewed one last February) he blames all of America’s problems on non-Calvinists and contributes all of her virtues on Calvinists. 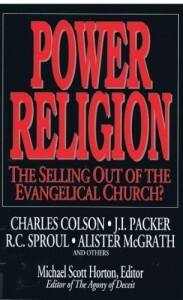 This volume tends to do the same thing (especially part 3 on church growth). George Whitfield and Charles Finney take much of the blame while Jonathan Edwards takes the credit. I am grateful for the information on the Charismatics and truly Arminian movements of our day. They are doing great harm. I think that we need to be careful about lumping all sublapsarians into the same boat with James Arminius. That boat won’t float.